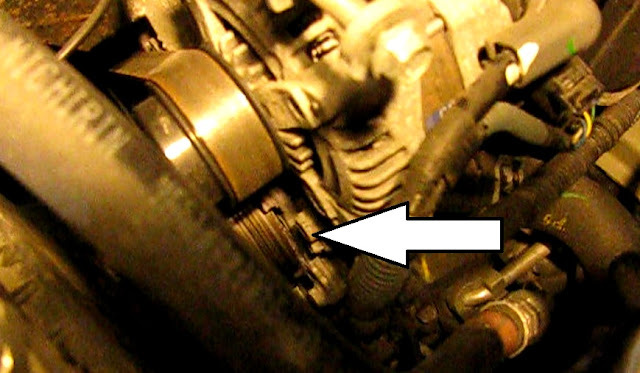 An adjustment bolt on the alternator provides belt tension on Toyota's 1.8L engine. This belt is easier to replace than many, but does require that the alternator mounts are loosened up. This engine was used from 2009 to 2013 and is also found on the Yaris, Matrix, Scion xD and Pontiac Vibe. Shown is a 2010 Toyota Corolla. Tools: 10, 12 and 14mm 3/8" sockets and ratchet, breaker bar (optional). Make note of the belt path for reassembly. I have a drawing of it here. 2) Loosen the top 12mm bolt alternator mounting bolt. 3) Loosen the lower 14mm alternator pivot bolt. This is where a 1/2" breaker bar can be useful. 4) Measure or make a mark on some paperboard of the length of the rearmost thread on the tension relieving bolt above the alternator. This will help to place the near correct tension back on the belt. 5) Turn the belt tension adjusting bolt counterclockwise a number of turns, pushing the loosened alternator rearward with each several turns. Repeat until near the end of travel on the bolt or the tension is relieved enough to take the belt off the alternator. 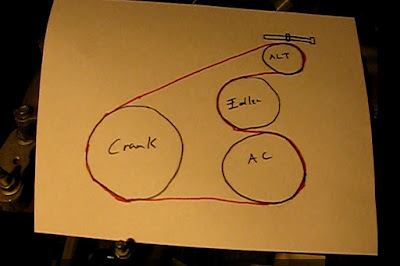 1) Re-position the belt over the crankshaft (take care not to get it under the lip of the little timing mark) and ac compressor first, then under the idler and finally up and over the alternator. 2) Turn the adjustment bolt clockwise until the rearmost length of the thread matches up with mark on the paper made earlier. Check the tension on the belt. There should be 1/2" of deflection at the midpoint of the longest straight run of the belt. 3) Tighten the lower 14mm pivot bolt. 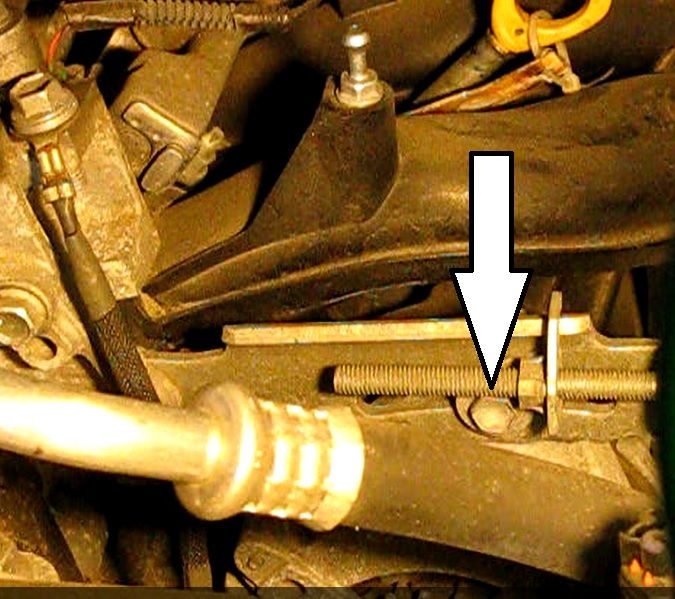 4) Tighten the upper 12mm mounting bolt, below the adjuster. 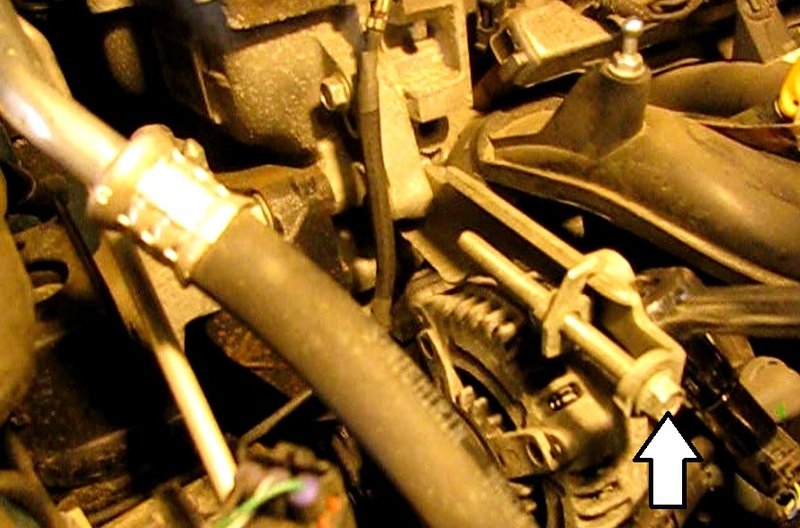 Numerous boisterous screeching clamors or other general motor commotions can be followed back to your serpentine belt. Uncalled for pressure on the belt can prompt the wear of different things around it and spot fix strain on whatever is left of your motor. In any case, there is uplifting news. Supplanting a serpentine belt is a really simple procedure, the length of you have the right arrangement of instruments and a little know how. This article is, the thing that I accept to be, an exhaustive instructional exercise on the substitution of your serpentine belt. Great to hear you made use of this post. You're right, there aren't many cars that use this old school way of putting tension on a serpentine belt. I'm glad you found my tutorial! How many pounds of pull do I use to get the half inch deflection to properly tension the belt? That is not an idler. It's the water pump. How many pounds do you pull to get the half inch deflection? Seems your instructions are lacking is why you delete comments instead of seeking out the answer and posting it here. I'm sure a real mechanic could tell you the deflection vs. pull needed to obtain that deflection. Thank you for such a detailed instruction. I would also like to advise a good service EssayReviewExpert.com/ that contains all the websites with essay writing srvices. Tae has a detailed description and rating. This way you can only choose the best one.